Long time listeners of Half Ashed and former readers of The Cigarmy will know that I have been a big fan of Luis Sanchez’s cigars (and those he makes for others) for a very long time. So, when I happened to share a couple of messages with him recently and he offered to let me try his latest creation, I – of course – jumped at the chance. He passed along a couple of both the natural and maduro versions of the La Tradicion Cubana Reserva Familiar, the natural being today’s review offering. The extensions are spun off from the standard La Tradicion Cubana line, with a couple of minor differences. 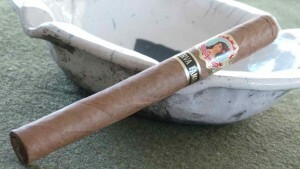 The Reserva Familiar features an Ecuadoran wrapper, an as-yet undisclosed binder and Dominican fillers. Interestingly, the filler blend contains some tobacco from Luis’ recent venture into farming on his Dominican property. The samples I received were in a 7” x 50 churchill vitola. Each of the natural versions received carry a very light, evenly colored brown wrapper. They were quite smooth – albeit dry – to the touch with very faint veins. I found no anomalies within the pack from head to foot. Both provided near perfect resistance and some sweet hay flavor on the cold draw. As for aroma, it was faint but evoked memories slightly of musty hay. Not freshly hewn hay; the kind you’d find in the loft a year after cutting. Even before puffing, the fragrance alone was enjoyable while lighting. With those first few puffs, there is a very slight vegetal character; however this dissipates within a couple minutes. The blend instantly separates itself from the standard LTC line in that it begins with noticeably more spice. It’s certainly not overwhelming, but considering the sedate nature of its brother, this one is significantly more pronounced. Once the burn is fully established, the spice becomes a bit more demure and is joined by a toasty sweetness that I find characteristic of Luis’ creations….and enjoy immensely. In terms of construction, there’s little for which to fault the cigar. On the first example, there are a couple of what were likely handling dings on the wrapper, and one small crack about ½” up from the foot. Once the burnline got to the crack, it did expand slightly but never spread. It quietly resolved itself with no further issue after about 10 minutes. One other time, a similar crack appeared and burned away. This did not impact the experience, but it should be noted that the wrapper leaf is very delicate and ought to be handled carefully. Other than that, construction was spot-on for both examples. By the time I’ve finished the first third of the cigar, the spice has modestly returned. The earlier sweetness has been replaced by a darker, more berry-like note. This is new. I have smoked most of the LTC range, and don’t remember this coming through in any of the other blends. It’s quite enjoyable, and provides a long lasting, pleasant finish between puffs. This deeper sweetness persists throughout most of the midsection of the cigar, with interspersed periods of moderate spice. There is a slight drying effect on the palate, which I understand to be driven by pH in the smoke from any particular blend (then again, I’m no scientist; take that for what it’s worth: the price of admission). Progressing into the final stretch of the Reserva Familiar brings renewed spice, especially on retrohale. Throughout the duration of the smoke, the interplay of this spice with the berry like sweetness was delicious. In the closing minutes of the cigar, I also noticed a beautifully deep, buttery sweetness accompanying the spice felt on the soft palate. I was a believer in Luis Sanchez’ blending prowess before; I’m more so now. Quite frankly, both Craig and I fell head over heels for the original La Tradicion Cubana line. Had the story stopped there I would have been happy to continue smoking them ad infinitum. However, this offshoot from the line has introduced bold, interesting flavors to an already fantastic blend. In a true test of my recently instituted review architecture, I had to forcefully impose the strict guidelines with regard to the earlier noted minor construction irregularities. Had I not done so, the La Tradicion Cubana Reserva Familiar would have likely scored a couple points higher than its already impressive 91. If you haven’t tried any of the LTC, TL Johnson, Santos de Miami, or other Sanchez-made cigars, I highly recommend them…and that’s coming with zero strings attached. These cigars are about as firmly in my wheelhouse as possible. In a true test of my recently instituted review architecture, I had to forcefully impose the strict guidelines with regard to the earlier noted minor construction irregularities. Had I not done so, the La Tradicion Cubana Reserva Familiar would have likely scored a couple points higher than its already impressive 91. If you haven’t tried any of the LTC, TL Johnson, Santos de Miami, or other Sanchez-made cigars, I highly recommend them…and that’s coming with zero strings attached. These cigars are about as firmly in my wheelhouse as possible.